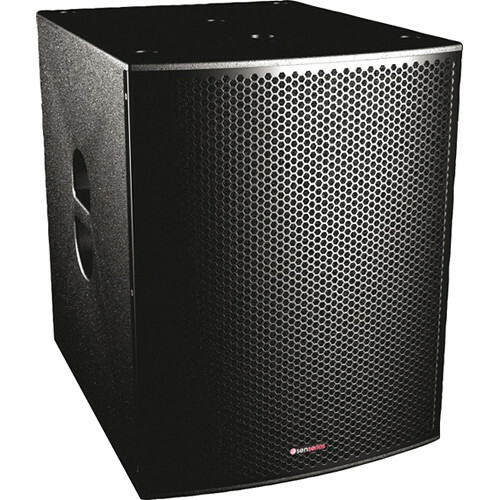 The Sense 15B 15" Passive Loudspeaker from American Audio is a professional-quality subwoofer that's ideal for bass reinforcement alongside the Sense series full-range loudspeakers for portable or installed applications in medium-sized venues. The rigid plywood cabinet has a durable black paint finish and a powder-coated steel grille with acoustic foam for lasting durability and performance quality. The sub has a 15" aluminum basket woofer with a 100mm voice coil to deliver a powerful bass response with excellent dynamics and frequencies as low as 40Hz. The sub has an LSM speaker management system and can accept up to 1800W of peak amplifier power for a strong, distortion-free performance. The rear panel has a pair of NL4 Speakon inputs for wide compatibility with a variety of sound systems and devices. The cabinet has handles integrated into the sides for convenient transportation. There is also an M20 pole socket on the top panel for mounting a full-range speaker. Box Dimensions (LxWxH) 26.0 x 25.0 x 20.5"
Sense 15B 15" Passive Loudspeaker is rated 3.0 out of 5 by 1. Rated 3 out of 5 by Martin R. from Not amazed, but you can't beat the price You get what you pay for. It's a weak muddy sounding sub. But hey, look at that price! Good for low budget projects.